Marietta's Quilt and Sew repairs most brands and models of machines. Our machine technicians are on site. You can drop off your machine anytime during normal business hours. We offer a full-service repair department! 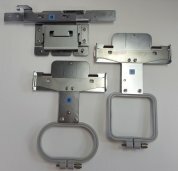 Our Machine Technicians have over 10 years combined experience in the industry and are both Baby Lock and Brother certified. Service work is done on site; with the rare occasion that your machine may be shipped to another location! In most cases, machines are repaired within 5-6 business days. Don’t wait until your machine isn’t working to bring it in for service. Just as your car needs regular maintenance, sewing machines require servicing to ensure optimum functionality and long life. How long does it take to service my machine? We strive to service machines within 5-6 business days depending on the volume. If there are any problems in the repair process, we will contact you and keep you informed. No appointment is needed. What is the charge for a full service? *A full service on all machines include: Cleaning, oiling, adjusting and setting the timing and tension. *If we can not fix your machine, or if you do not want further service after the bench fee, there is no additional charge. Our policy is to call you and discuss repair options. Prices are subject to change depending on the amount of labor that is needed. It is recommended that all machines be service once a year. If your machine is used heavily, you may want to consider having it serviced every 6 months. What do I need to bring with my sewing machine or embroidery machine? Note: When bringing in the Alliance or the Persona, you must also bring in the Frame 50 assembly, Frame 70 assembly and the Tubular Round Arm Set E. Please see picture. Drop off your scissors or rotary blades for sharpening and we will have them ready within 4-5 days.